50,000 BCE - The Maltans colonize Oa and discover Oan Energy, a fundamental life-element that permeates the fabric of reality, granting the Maltan settlers of Oa immortality. 24,000 BCE - The Maltans discover that the best of them, Krona, violated Oan law when he traveled to the beginning of time and undermined all of creation by infusing reality with entropy. The Maltans collectively choose to police the universe against their own creation. The Maltan scientists and philosophers, collectively called the Guardians, disagree with the Maltan leadership and warriors, collectively called the Controllers, in the proper way to do this but are overruled, and the Manhunters are born. 22,000 BCE - The Anti-oan flaw in reality corrupts the Manhunters and they attack Oa. The Controllers insist in rebuilding them, and are eventually cast out of Oa by the Guardians, who construct the Central Oan Power Battery and begin building the Green Lantern Corps. ​51 years ago - Manhunters tech is discovered by the Psions. Their meddling reactivates the Manhunters who assault Sector 666. The Guardians of Oa instruct the Green Lantern Corps to try to stop them, beginning the Manhunter Wars. 43 years ago - The Guardians of Oa are forced by Atros & other leaders to close off Sector 666 after the defeat of the Manhunters, forbidding the Green Lantern Corps from ever returning. 18 years ago - The Guardians of Oa clash with new Green Lantern recruit Hal Jordan, but earns his place when he saves Oa from the assault of Legion. 10 years ago - ​The Guardians of Oa are forced to place Green Lantern John Stewart on trial in Citadel court when he is framed for the destruction of the planet Xanshi by the Manhunters. He proves his innocence in Citadel court, prompting the Manhunters to attack Oa. 9 years ago - ​The Guardians of Oa are fractured when a group of Rogue Guardians, lead by Scar, splinter away and create their own group of Lanterns, including Guy Gardner. 8 years ago - ​The divide in the Guardians of Oa leaves them unprepared for Thaal Sinestro's & the Weaponers of Qward ​massive coordinated assault of Citadel Space. They is ultimately stopped by Hal Jordan and the Green Lantern Corp. The Rogue Guardians' honor guard Lanterns are depowered. Sinestro is trapped on Earth for a time with Dr. Sivanna's Secret Society but has his ring stolen by Guy Gardner and is imprisoned in the Oan Power Battery. ​​​​7 years ago - Ganthet, one of the Guardians of Oa, sends Hal Jordan, Killowog & Ch'p to the forbidden Sector 666 to investigate a group of Lost Lanterns being held hostage by Atrocitus & the Red Lanterns. They are assisted by Bro'Dee, who is given a unique Blue Battery by Ganthet to become Saint Walker, the Blue Lantern. ​5 years ago - Coast City on Earth is destroyed by Mongul. The Guardians of Oa forbid Hal Jordan from rewriting time to save it, and in his grief and madness he attacks Oa with the intention of absorbing the power battery. Thaal Sinestro is released from the Power Battery by the Green Lantern Corp in a last-ditch effort to stop him. Their battle destroys much of Oa. Hal absorbs the Power Battery & becomes Parallax. Green Lantern Rings across the galaxy are depowered, leading to the deaths of many Lanterns. Killowog uses the ancient Lantern weapon the Starheart to save the Guardians by bringing them to Mogo, and folding the entire planet into the Paths Beyond. 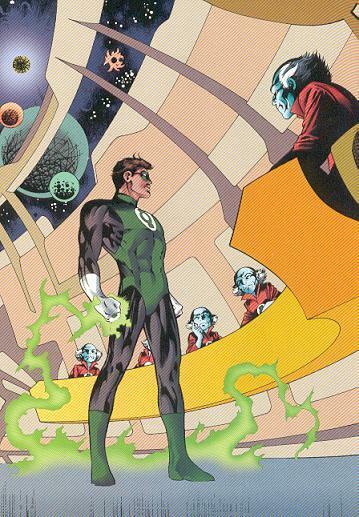 Only Ganthet remains behind. He forges a final ring and brings it to Earth, giving it to Kyle Rayner. 1 year ago - The Guardians of Oa, along with Mogo, are brought back from the Paths Beyond by Killowog when the Oan Power Battery is relit by the surviving Green Lantern Corps. There are a lot of tropes at play with the Guardians, story elements that you see repeated over and over through all of genre fiction. The reason for that is a largely because they STARTED here. Sure, some of these concepts might have roots in less mass-market places, but the Green Lantern and their story of a planetary space force mark the turning point where a lot of these ideas cross over to become part of the cultural lexicon. The simple idea of alien benefactors granting someone some sort of space-based authority or power is as well trod a story beat as you can get, because it's great and we all love it. While Hal Jordan appeared for the first time in Showcase #22 in 1959, the Guardians actually didn't show up until Hal got his own series. Green Lantern Vol 2 #1 in 1960. For the most part they don't really serve as CHARACTERS in their own right exactly. Yes, they are the immortal and omniscient force that imbues Hal with his powers, but that sets them up more as a plot device; if anything the best you could expect was for them to follow the classic 'angry sargeant' trope, which totally works in a story about space cops. There have been exceptions, of course. Sometimes you see certain Guardians start to crop up as rogue elements, like Scar. 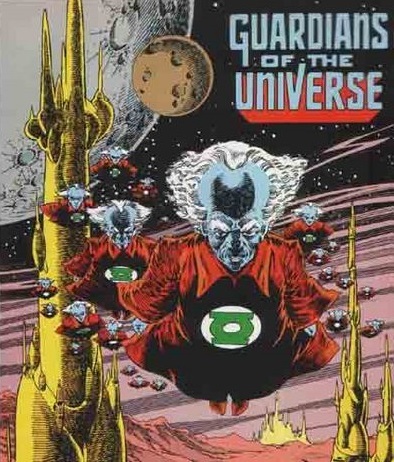 Of course there's also Ganthet, the one member of the Guardians that will stand out as his own character, often going behind the backs of the rest of them to side with the heroic Lanterns. Sometimes, when the hero is empowered by an outside force, it becomes a bit of a balancing act to make sure that outside force doesn't just take over the story on it's own. The Guardians have walked that tightrope for years. One obvious change we made was that we're calling them the Guardians of Oa, rather than the Guardians of the Universe. This might seem simple, but it's part of a larger issue that we have to constantly deal with throughout the timeline... you have to be very careful to establish clear boundaries on the power and influence on these characters, and in the stories they occupy. To say the Guardians influence extends across the entire universe writes you into a corner when the story needs areas outside their influence. It's a pretty simple concept, but comics are in a constant state of one-upmanship, trying to make stories bigger and wider-ranging. We call them the Guardians of Oa, and establish that their jurisdiction is limited to our own galaxy. The hardest part, though, is the fact that you're talking about the ancient pre- history of the timeline. Traditionally the Guardians go back millions of years, but the story we are trying to tell just works better if you thought in terms of thousands of years rather than millions. More than that, though... you're talking about the nature of live vs entropy... oan energy vs anti-oan energy. It's vital for huge stretches of the story, and it has to be set up properly here.